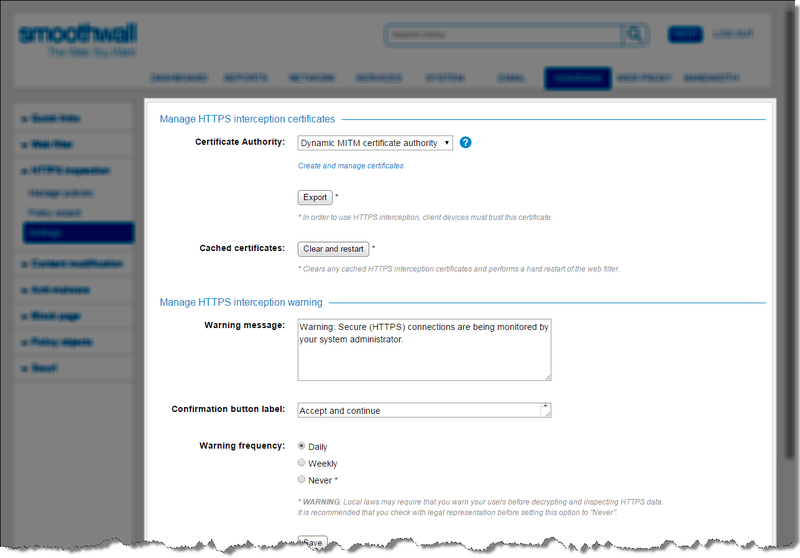 The HTTPS inspection feature of Guardian makes use of certificates to sign for HTTPS services, and a warning message displayed to used who attempt to access HTTPS websites. You can change the SSL certificate used to sign for certificates within the HTTPS interception feature. You must ensure your client devices trust this certificate. 1. Go to Guardian > HTTPS inspection > Settings. 2. From the Manage HTTPS interception certificates section, choose the relevant certificate from the Certificate Authority drop-down. You can create a new certificate to use for these services. Click Create and manage certificates to go directly to the System > Certificates > Certificates for services page. For a detailed description of how to create and manage these certificates, see Managing Certificate Authorities and Certificates. Note: If you make use of a centrally managed Smoothwall configuration (see Setting up a Centrally Managed System), you must ensure the parent node's HTTPS interception certificate is installed and set on all child nodes. This is particularly important for configurations that replicate MITM certificates (see Managing Archives). It is possible to clear Guardian’s cache of certificates generated for use with HTTPS inspection policies. 2. From the Manage HTTPS interception certificates section, click Clear and restart. Note: Clearing the cached certificates results in a full restart of the Guardian web filter. All Guardian services are halted for a few minutes so it is recommended you do this during a quiet time. 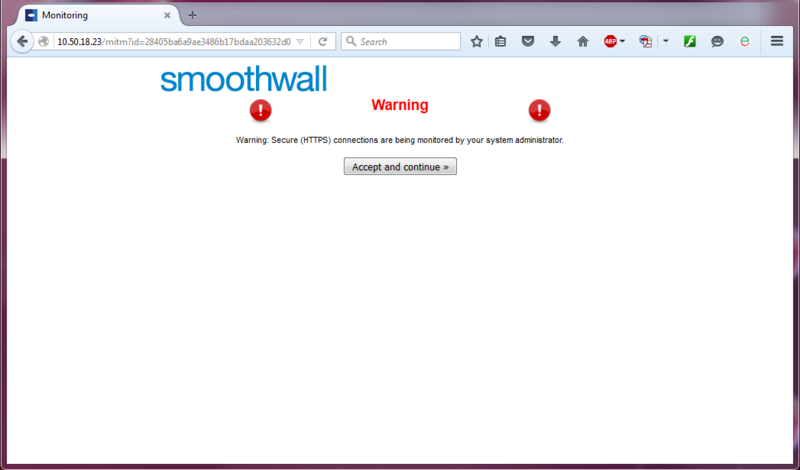 To help prevent BYOD users being presented with Man-in-the-Middle (MITM) warning pages, you can use the HTTPS Interception page, located on the Smoothwall, to advise users to download and install a certificate. A knowledge base article is available to guide you through the necessary steps. When implemented, Guardian displays a warning page informing users who try to access HTTPS web sites that their communication with the site is being decrypted and inspected. Users must actively accept the decryption and inspection in order to continue to the site. • Warning message — Either accept the default message, or enter a custom message informing users that their HTTPS connections are decrypted and filtered if they continue to the site they have requested. • Confirmation button label — Either accept the default label, or enter new text to display on the button that users must click to confirm that they accept that their HTTPS connections are decrypted and filtered. Once they have clicked on the button, they can continue to the site they requested. Select to display the warning daily. Select to display the warning weekly. Select to never display a warning. Typically, you would not use this option, however, if you are using the Smoothwall Connect Filter for Windows client, it is recommended you disable the warning message to ensure correct operations. For more information, see About Connect Filter. The URL used to present the warning page, refers to the Guardian IP address. However, if a system redirection to hostname setting is in place, you can force the hostname to be used instead. You do this from the System > Preferences > Hostname page. For a detailed description of how to configure this page, see Changing the System Hostname.